There are many ways of creating herbal formulas, whether it’s by a certain ratio, according to herbal actions, or simply the kitchen sink method where you throw every herb you can think of into a mixture. 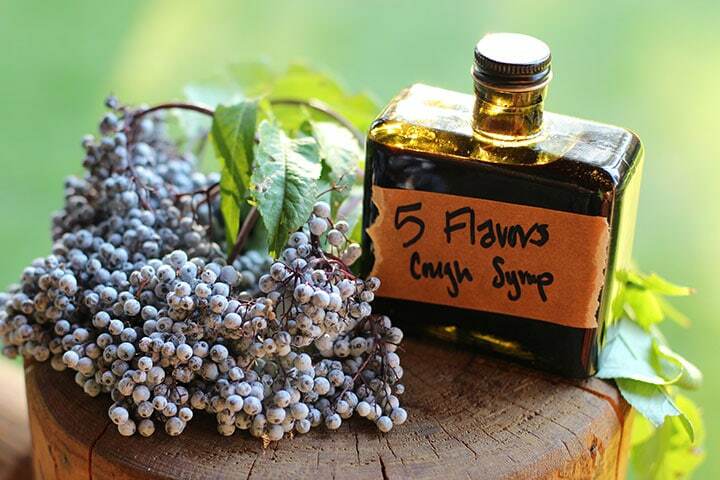 This herbal cough syrup recipe was inspired by formulating with the TASTE of herbs. I wanted to create an effective syrup that encompassed all five of the tastes in Traditional Chinese Medicine (pungent, salty, sour, bitter, and sweet). It’s commonly believed that a meal isn’t complete unless it has all the flavors, so I thought it would be interesting to apply this to an herbal formula as well. While western herbalists don’t often talk about the taste of a plant (although this is slowly beginning to change), classifying herbs by their taste is a major foundation of Ayurveda and Traditional Chinese Medicine, two of the largest and oldest living systems of medicine today. The idea is that, by simply tasting an herb, you can understand the big picture of the ways it could be used. Taste, as well as how you feel after tasting, can also give you insights into the plant’s energetics. Is the plant warming like cayenne? Or cooling like a cucumber? Does the plant restore moisture to the body like aloe? Or is it drying like dandelion’s diuretic qualities? Evaluating and understanding the taste of an herb is so important that I think it’s one of the most crucial skills an herbalist can have. That’s why I created the Taste of Herbs Flavor Wheel and that my number one online course is all about this subject! While this is a complex topic with lots of layers, here’s a short summary of the attributes we associate with each taste. Pungent herbs are warming and spicy and are used to awaken the senses and get things moving. A great example of this is how cayenne (Capsicum annuum) makes you sweat and gets your sinuses running. Salty herbs are high in minerals and often affect the balance of fluids in our bodies. Plantain (Plantago spp.) is a nutritive herb that can powerfully heal mucous membranes. Sour herbs stimulate digestion and build strength and they are often high in antioxidants. An example of this is drinking lemon water in the morning. Elderberries are a sour herb that is extremely high in antioxidants. Bitter herbs stimulate digestion and often have a cooling and draining effect that can help to modulate inflammation. An example of this is Oregon grape root (Mahonia spp.) which stimulates digestion and modulates inflammation. Sweet herbs nourish and build and are used to restore energy levels and modulate the immune system. Drinking astragalus chai daily is a great way to experience this effect. Now let’s take a closer look at the herbs in this herbal cough syrup recipe as well as their tastes. Elderberries are really high in antioxidants and are commonly used to shorten the duration of a cold or flu. In one study, people with the flu who took elderberry had their symptoms relieved four days earlier than those taking a placebo.1 Like most fruits, elderberries are classified as having a sour taste. Elecampane is a beautiful plant that can easily grow to six feet tall. It’s covered with bright yellow flowers that bees love. Herbalists use the root of this plant and it has both a decidedly bitter and pungent taste with a hint of sweetness (due to its high inulin content). Elecampane is famous for strengthening the lungs and is especially used for congested coughs. If you tasted a fresh leaf of plantain, you wouldn’t think it tasted salty but, apart from the mild bitterness of the leaves, it has a hard mineral taste that is due to the high mineral content (similar to kale). Plantain is a fantastic herb for general coughs and it excels at soothing irritated mucous membranes such as the throat and lungs. Rounding out the ingredients for our herbal cough syrup recipe is honey. Besides the wonderful sweet taste that makes this blend more palatable, honey is high in enzymes that are believed to stimulate the immune system. It’s also a mild expectorant and has been shown to be a safe and effective way to address children’s coughs.2 For this recipe I recommend using local honey from a beekeeper as this will ensure the best quality. If you plan on using this recipe for a child under two, use an alternative sweetener. This recipe is an all-purpose cough syrup remedy. Elecampane, plantain, and honey are expectorants with the latter two helping to soothe irritated tissues in the lungs and throat. Elderberries are famous for their ability to shorten the duration of a cold or flu. Store this in the fridge and use within one month. This recipe can be made with either dried or fresh herbs. Note that this herbal cough syrup recipe will not be as thick as commercial syrups. To make a thicker syrup, use sugar instead of honey and simmer the strained tea and sugar until it is reduced by half; let cool and it should have thickened up. Place the herbs and water into a medium sized sauce pan. Bring the water to a boil, then reduce the heat and simmer for 20 minutes, uncovered. You should end up with approximately 1/2 cup of liquid. Return the liquid to a clean saucepan. Add the honey and stir until well combined. If necessary, apply very low heat to warm the honey to allow it to incorporate. Pour the mixture into a bottle, label and keep in the fridge for up to one month. Adults can use a tablespoon every 30-60 minutes as needed. What do you think? And please register for our webinar above. It’s gonna be awesome! I made something similar at an Ayurvedic Immersion workshop and it tastes delicious so not hard to get my children to take it. Looking forward to the seminar! Is this webinar for the Taste of Herbs course? I already signed up! I think that it would be wonderful to see this awesome resource support local herb farmers or least mention the sustainability and benefits of sourcing your herbal medicine locally. The majority of herbs from mountainrose are great because they are certified organic, but are imported and mass produced from undiversified farms. I have not made this yet, but the information is so good! Thanks, Rosalee and John. This will come in handy. I have not taken an OTC cough syrup for a bazillion years, the wee ones have NEVER had one. This looks like just the remedy. Have an herby day! I can’t wait to try this. Stepping up my game from simple elderberry syrup. Thanks for everything you do! I have not used elecampane or plantain for coughs, though I’ve used plantain for skin issues. I look forward to trying this, though I’m pretty happy with elderflower/elderberry syrup recipes for winter coughs and viruses. I am enjoying this course tremendously. Thank you very much for all your dedication and love. You should spare some time with us in Mozambique. Hello, will this syrup truly last only a month in the fridge? I would love to find something that lasts the full winter season as I can’t predict when my kids will get their coughs. The more honey you add the longer it will preserve. If you add at least 50% honey then it will last for a long time in the fridge. I personally don’t like things that sweet so I prefer to make smaller batches more often. I have frozen syrups to preserve them longer. Freezing it a great idea. Also using Pomona pectin to turn them into a low-honey jam works great too. How would you change this recipe if the cough is dry or for someone who lives in a dry climate and doesn’t want to dry themselves out more (thereby making a dry cough worse)? Or do you feel it doesn’t need to be altered in any way in this case? Thx! I would try it as is, if you then found it to be too drying you might try adding rose hips or marshmallow root. Hi! I’m just so excited to have found you guys! I’m fairly new to herbs and really didn’t know where to start learning. Thank you for this wonderful cough medicine. I really want to try to get us on a natural path and I so appreciate you sharing your knowledge and wisdom with us.. Can this be made into a tincture so that it will last longer? what do you think about making an infusion of the herbs instead of simmering them for 20 minutes? I don’t think it will be very strong. You could always try both and taste the difference for yourself to see what you think. I love the grapefruit bitters, my kids get into it when their tummies are bad! We used Taste of Herbs in homeschool, it was great and the site is phenomenal! Very interesting! I have been researching about the healing prperties of herbs and have always done this through articles from Dr. Christopher Hobbs. Your websites are very encouraging for illustrating the use of herbs the easier ways. I have not yet started to to put all these in practice because of lack of pure organic herb source. I found Mountainroseherbs but they do not ship to the UK where I live. However, I am trying to source for organic herbs here in the UK. I love what you are doing. Would a percentage of alcohol help preserve this recipe so it didn’t need refrig.? Might not have one. It you don’t have a frig.Whats a good way to keep these recipes? Thank You, Rosalee. In order for a preparation to keep long term it has to be either 50% sugar/honey OR at least 25% alcohol. Sometimes I just free hand it by adding some alcohol and honey and hope for the best. I was wondering the same thing. I put brandy in my adult elderberry elixir. I might make up a batch and try the brandy. I don’t want to add so much honey. Trouble I’m having is finding plantain! For some reason, all of it in my yard has disappeared! I tried growing from seeds this past summer and had zero luck. Gonna have to go visit a friends farm. Thanks for all you do! What a wonderful combination of herbs! I’ve used cough medicines with plantain (one of my favourites) and elecampagne, and I love elderberries, so I can’t wait to make this one. Thank you for sharing. Again! Around this time of year when we are back to school and closed up in our homes, our family will begin our mornings with a spoon of Elderberry syrup to help keep us healthy. I haven’t tried elecampane but I am looking forward to trying this new recipe. I found Slippery Elm Bark in a dried powder. I would love to incorporate it into this recipe as a soothing element. Would it be okay to add it and how would it be best added? If it were me I would just use it as a separate tea. You could try adding it here, but since I haven’t done that myself I would have to play with it to get the right ratio, etc. Thanks for the recipe! I can not wait to try it. Can you use this preventatively? I’m also thinking I don’t know when my kids will get sick and it is a short shelf life. However, my son gets sick pretty frequently and then struggles with asthma, so I’m wondering if it would be appropriate for him to just have a spoonful everyday even while not actively sick? Elecampane and elderberry are both used preventively. Elecampane for lung health and elderberries to prevent upper respiratory infections. I think it’s worth trying! How does this compare with your onion honey recipes, also for coughs? When my kids get sick, I make a batch of that and then make a tea with hot water, lemon, apple cider vinegar and onion honey. They love it and it really seems to soothe. Onion honey is a great remedy too! To get a sense of the difference between the two I recommend giving them both a try to see for yourself. Isn’t thyme one of the more traditional cough remedies and wouldn’t adding a bit in with this make it more effective? Thyme is a lovely herb for coughs… I can’t necessarily say it is “more traditional”, but certainly an effective herb when used correctly. I personally prefer it as a strong tea. You could try adding it to this recipe and seeing what you think. You don’t give me an option to print this & if I copy & paste it, it is all black & unreadablr. At the very end of the recipe, just before my signature, there is a big green box that you can click on to download a gorgeous printable pdf with the recipe. Some people can’t use honey. Is there another alternative for this concentrated sweetner, such as stevia? Sugar of course. There’s many other alternative sweeteners out there such as rice syrup. If it’s a blood sugar issue then I would omit all sweeteners and drink this as an unsweetened tea instead. Thanks for the recipe! I was so happy to open your email today because I happen to have a cough right now. Ugh! I’m wondering if this recipe is safe for use during pregnancy. I’m pregnant and having a cold is soooo miserable. Thank you! All of the herbs in this recipe receive the highest safety rating from the Botanical Safety Handbook, but none of them have been exclusively tested for safety in pregnancy. I’ve seen where giving young children, under two, honey and peanut butter is being rethought due to later allergic reactions. Meanwhile, rice is also being rethought due to high levels of arsenic and other pollutants found. The reason children under two are not advised to have honey has nothing to do with allergies. Instead, it’s that their immune systems aren’t fully developed and therefore they can be susceptible to infant botulism. Can I buy it already make ? I am a little nervous using the elderberry, as it states in packaging “may cause vomiting and diarrhea” …. is that a side effect when your using the elderberry as instructed in this recipe, since your cooking it and then draining the liquid? Could you name some other herbs that could be a substitute in this recipe for the elecampane? I don’t have that and would like to use some of the herbs I do have on hand. Thanks. I made a batch of this and found it amazing! I love the taste, just like an old traditional cough syrup should taste. My grown up son takes a spoon of this every day, just as a tonic! I tried using the left over pulp after squeezing it through the nut milk bag to make a second batch. I put it back in the saucepan with another 2 cups of water and boiled it up again for 20 minutes. The second batch had a slightly weaker flavour but really much the same. We hardly noticed any difference, and got two batches for the price of one!